The St Thomas Leisure Ground was opened on 30th March 1891, for Queen Victorias Jubilee, at the instigation of the Local Board of Health for the people of an expanding St Thomas. Music for the ceremony was provided by the Post Office Band followed by a speech from the chairman of the Local Board of Health, beseeching the people to not damage the shrubs. This pleasant little 4 acre park off Cowick Street, opposite St Thomas church, cost £3,600 to create. The central 3 acres were originally reserved as a children's playground. The food shortages of the First War caused by the German U-boat blockade led to 32 allotments being dug in part of the park. The park now has play facilities for children from 2 to 12, including the paddling pool which was opened in 1938. In February 2005, vandals caused £5,000 worth of damage to a children's playtrain in the park. The City Council offered £500 reward for information leading to the vandals being caught. In March 2005, Wessex Trains offered to replace the burnt-out equipment. There have been two Dawn Redwoods or Metasequoias planted in the park which will, when mature, reach 35 meters in height, thus continuing the tradition of planting by the Veitch's in the nineteenth-century for the city. 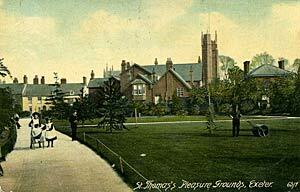 An Edwardian St Thomas Pleasure ground.